The original GrapeFruit Seed Extract. A compound derived from the seed and pulp of grapefruit. 10 drops of NutriBiotic GSE Liquid Concentrate contains 100mg grapefruit seed extract in a glycerin base. For adults: mix 10 drops of NutriBiotic GSE Liquid Concentrate into a glass of water or juice (5 oz. or more) and drink 1-3 times daily, with or without meals. For children 5 years of age and older: mix 3 drops into a glass of water or juice, 1-2 times daily, with or without meals. Or, use as directed by your healthcare professional. Do not use full strength in mouth. Grapefruit Seed Extract is a factor in the maintenance of good health. Each tablets contains 435 ug RAE vitamin A and 10mg ZInc. Along with grapefruit seed extract 125 mg, rice protein fiber (filler), vegetable cellulose (binder), vegetable stearine (lubricant), guar gum, ethylcellulose, and vegetable coating. Made without soy, milk, egg, yeast, corn, wheat, sweeteners, and preservatives. Adults: one tablet one to three times daily. Children 6-14 years of age: take one tablet daily. Take with or without meals. Not recommended for children under 6 years of age. WARNING: Keep out of reach of children. Do not exceed suggested use without consulting a licensed healthcare professional. Each capsule contains: Echinacea angustifolia 4:1 200mg. Non-medicinal ingredients: grapefruit seed extract, hypromellose, and magnesium stearate. Take one capsule three times daily, with or without food. This product is not recommended for children under 12 years of age. Electrolytes help restore lost (through sweating) and utilized (through use) electrolytes helping promote a quicker recovery. Each capsule contains Ascorbic acid USP-FCC (corn free) 100mg, potassium gluconate 75mg, calcium carbonate 50mg, sodium chloride 53mg, magnesium carbonate 25mg, zinc sulfate 3mg, chromium nicotinate 25mcg, magnesium stearate (vegetable lubricant) and vegetarian capsules. This product does not contain soy, milk, egg, yeast, corn, wheat, excipients, sweeteners, colourings, flavours, or preservatives. For maximum electrical response, adults take one to three capsules before athletic activity. Take one to three capsules after performing athletic or strenuous activity. A unique formulation combining grapefruit seed extract, vitamin C, echinacea extract, astragalus, ginger root extract, goldenseal extract, yarrow extract, and the mushroom extracts of reishi, maitake, and shiitake. Grapefruit seed extract 250 mg, Meta-C® (spirulina-bound calcium ascorbate), echinacea angustifolia extract (4:1), astragalus, reishi mushroom extract (4:1), maitake mushroom extract (4:1), shiitake mushroom extract (4:1), ginger root extract (6:1), goldenseal extract (6:1), yarrow extract (6:1), zinc (gluconate), microcrystalline cellulose (binder), magnesium stearate (vegetable lubricant), and natural food glaze coating. Made without soy, milk, egg, yeast, corn, wheat, sweeteners, or preservatives. At first signs of imbalance or depressed resistance, take one tablet daily with or without meals for two weeks. Not recommended for children under 12 years of age. 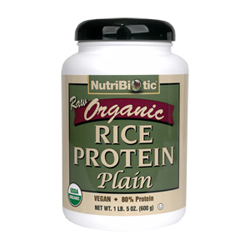 A rice protein that is a great-tasting vegetable protein made from non-genetically modified California-grown brown rice. 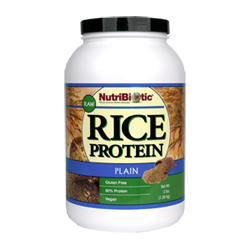 Enzymatically processed rice protein from whole grain, sprouted brown rice. Made without: soy, milk, eggs, wheat, corn, nuts, yeast, and preservatives. Add one serving (1 tablespoon) to a shaker bottle or glass with water, rice milk, or beverage of your choice. Shake or mix well. Or, you may add a serving to your favourite smoothie or recipe. A bubble bath that is tear-free, oil-free, vegan, hypoallergenic, and pH balanced. Squeeze desired amount of NutriBiotic Bubble Bath under warm, running water. Gentle and non-drying, its deep cleansing action leaves no pore-clogging residue. Purified water, sodium laureth sulfate (mild sudsing agent derived from coconut oil), disodium oleamido sulfosuccinate, cocamidopropyl betaine, allantoin, panthenol, PEG-7 glyceryl cocoate, glycerine, sodium PCA, cucumber extract, extracts of sage, coltsfoot, yarrow, balm mint, chamomile, rosemary, althea, wild thyme and horsetail, CITRICIDAL (0.5%), methylparaben, propylparaben, diazolidinyl urea (non-animal source), organic fragrance and citric acid. Made without: sodium lauryl/laureth sulfates, cocamide DEA, free chlorine derivatives, colorings, animal products, fragrance, gluten, phosphates, and paraben preservatives. Apply to skin for gentle cleansing. Rinse thoroughly. WARNING: FOR EXTERNAL USE ONLY. Use only as directed. A deodorant stick that uses 1% grapefruit seed extract (GSE). Deionized water, propylene glycol, witch hazel distillate, sodium stearate, certified organic aloe vera gel and grapefruit seed extract (GSE). Made without: soy, milk, eggs, wheat, corn, nuts, yeast, and preservatives. A shower gel that is a moisturizing, non-soap, vegan, cleansing formula designed for your entire body, including your hair. Purified water, sodium laureth sulfate (mild sudsing agent derived from coconut oil), cocamidopropyl betaine, soyamidopropylkonium chloride, PEG-7 glyceryl cocoate, hydroxypropyl trimonium vegetable protein, trimethyl ammonium chloride, magnesium/iron/zinc/copper/silicon glycopeptides, TRP (Tissue Respiratory Factors), CITRICIDAL (0.5%), organic fragrance, tocopheryl acetate (vitamin E), extracts of sage, matricaria, rosemary, balm mint, althea, wild thyme, coltsfoot, horse tail and yarrow, methylparaben, propylparaben, diazolidinyl urea (non-animal source), tetra sodium EDTA and citric acid. Lather head-to-toe for a luxurious whole body shampoo experience. Rinse thoroughly.